I am sure you have all been to plenty of baby showers and you either look forward to or dread the opening of the gifts. Clothes are cute... Blankets are fun, but here are a few things that I received that I thought were truly unique. 1. A gift certificate for a baby photo shoot- With all of the planning that I've been doing this is something I completely overlooked, but am so glad that I received it! 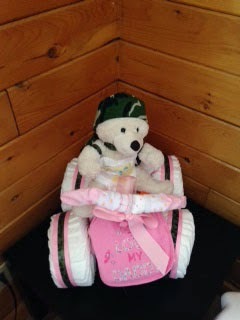 Now my lil girl has her star moment all set up for the week she arrives home (I will be sure to share these pics). 2. A gift certificate for shutterfly- If you aren't familiar with shutterfly or snapfish, check them out online. They are great ways to upload baby pics, and make photobooks, calendars, mugs, "thank-you" cards, etc. for you and your family. 3. A red wagon filled with gifts!- So much fun, and so cute! 4. To spice up the clothing gift, why not display them in a unique way? Hang your clothes on the line (like you would if you were to hanging them out to dry), fold the clothes into the hamper, leave one end hanging out with directions to "pull here". The mom-to-be may need help opening this gift, but that's what makes it fun and is sure to get all the guests attention. 6. 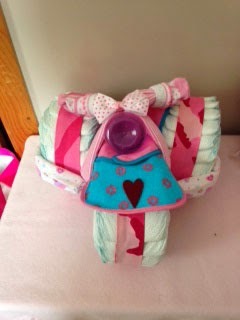 If it's a baby girl, headband stations at the shower are a way to get the guests involved and moving around. 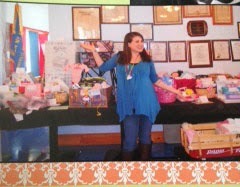 What are some creative gifts that you have given or recieved at a baby shower?! I love that last idea! Perfect for saving time, people from having to wrap and the awkwardness of people watching you open everything!